Comments: Black-tailed jackrabbits were named for the black, upper tail fur and long, "jackass-like" ears. 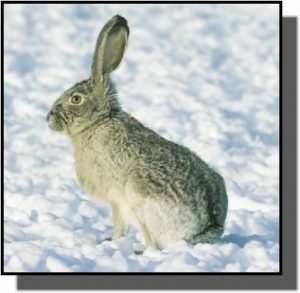 They are typical hares, having long ears, long legs and precocial young. They live in open areas with good visibility and scattered shrubs for hiding. They can accelerate rapidly to 40 miles per hour when escaping predators. Black-tailed jackrabbits can leap as high as 6 feet and as far as 20. If caught by a predator, they will shriek, bite and kick. Females can produce 4-7 litters, with 2-4 kits each, from late winter to late summer. In the past, "jackrabbit roundups" were common events where they were herded and clubbed, to both reduce their numbers and to sell as food. In recent years, changes in farming practices have kept their numbers down. Distribution: Black-tailed jackrabbits range from Baja California and south-central Mexico to west-central and western United States. They prefer arid habitats. They can be found throughout Kansas in prairies, overgrazed rangelands, and croplands. Food: Black-tailed jackrabbits feed on green vegetation, including forbs, grasses, shrubs, cactus, tree bark and agricultural crops.